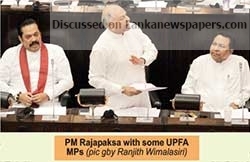 Ousted Prime Minister Ranil Wickremesinghe yesterday said that he had mustered the support of 122 MPs to prove the ‘purported government’ did not have the required numbers in the House. “A no-confidence motion has been passed in Parliament. The Speaker officially announced the passage of the motion; 122 MPs have signed it, stating that they have no faith in this purported government,” Wickremesinghe said so, addressing the media at the Parliamentary complex. “If anyone doubts our majority, he can move a motion or resolution in parliament tomorrow against us or the motion we have passed today. It is now clear the purported government and its ministers are not legal anymore. We call on all public officials not to follow the orders given by the illegal ministers because carrying out their orders would be illegal. who helped us to ensure the restoration of democracy. “When a motion of stepping out of Standing Orders was passed, the House could be moved for a vote by the Speaker not adhering to the Standing Orders.